This guest post comes courtesy of Ross Mason, CTO and founder of MuleSoft. 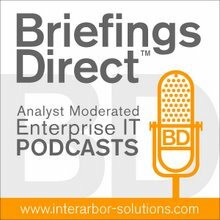 Disclosure: MuleSoft is a sponsor of BriefingDirect podcasts. While integration isn’t necessarily a new problem, the unique challenges of integrating in the cloud require a new approach. Many enterprises, however, are still using point-to-point (P2P) solutions to address their cloud integration needs. 1. Building vs. buying: If you have developers with integration experience in your IT department, you can have them build a custom P2P integration in house, rather than buy a packaged solution. Building your own integration, however, typically means that you will also have to manage and maintain a codebase that isn’t central to your business and is difficult to change. 2. Quickfire integrations: Let’s say you need to integrate two systems quickly and hire a developer to work on the project over a couple of days. You notice an improvement in business efficiency and see an opportunity to integrate additional systems. You hire the same developer and expect the same quickfire integrations, but the complexity of the project has increased exponentially. The takeaway? It’s always a good idea to approach integration systematically and establish a plan up front, rather than integrate your systems in an ad hoc P2P fashion. 3. Embedding integrations in your application: Although it might be tempting to embed P2P integrations in your web application, you should be cautious about this approach. It may be fine for really simple integrations, but over time, your integration logic becomes scattered in different web apps. Instead, you should think of integration as a separate tier of your application architecture and centralize this logic. One of the consistently recurring mistakes of doing quick P2P integrations is assuming that things will not break. 4. Creating dependencies between applications: When you integrate applications in a P2P fashion, you create a dependency between them. For example, let’s say you’ve integrated App A and App B. When App A is modified or updated, you will need to change the integration that connects it to App B. You also need to re-test the integration to make sure it works properly. If you add App C to the mix, your workload can increase exponentially. 5. Assuming everything always works: One of the consistently recurring mistakes of doing quick P2P integrations is assuming that things will not break. The reality is that integrations don’t always work as planned. As you integrate systems, you need to design for errors and establish a course of action for troubleshooting different kinds of errors. Error handling is particularly troublesome when integrating software-as-a-service (SaaS) applications, because you have limited visibility and control over the changes that SaaS vendors make to them. 6. It worked yesterday: Just because P2P integration worked for one project does not mean it will work for another. The key is to test each integration you build. Unfortunately, P2P integrations are often built and deployed quickly without sufficient planning or proper testing, increasing the chances for errors. Although it can be difficult and does require a decent amount of effort, testing integrations is absolutely critical. 7. Using independent consultants: Many companies are not staffed with developers who have enough integration expertise and hire consultants to resolve their integration issues. The problem with this approach is that you often have limited visibility into whatever the consultant delivers. If you need to make changes, you typically need to work with the same consultant, which is not always possible. 8. Creating single points of failure: As your P2P integration architecture grows in size and complexity, its chances of becoming a single point of failure in your entire network increase as well. Minimizing the potential for single points of failure should be a priority when it comes to integration, but the lack of decoupling in a P2P approach makes it hard to eliminate bottlenecks in your system. Quick P2P integrations are relatively manageable when you have 2 or 3 systems to connect, but when you start adding other systems, your architecture quickly becomes a complicated mess. 9. Black-box solutions: Custom-built P2P solutions are usually black box in nature. In other words, they lack reporting capabilities that tell you what is happening between systems. This makes it very hard to debug problems, measure performance, or find out if things are working properly. 10. Creating a monster: Quick P2P integrations are relatively manageable when you have 2 or 3 systems to connect, but when you start adding other systems, your architecture quickly becomes a complicated mess. And because no two P2P integrations are exactly the same, managing your integrations becomes a major pain. If you invest in doing some design work up front, however, this will save you from having to throw away a tangled P2P architecture and starting from scratch to find a new solution under pressure. If you have a well thought out design and a simple architecture, you can reduce the management burdens and costs associated with integration. Ross Masson is the CTO and Founder of MuleSoft. He founded the open source Mule project in 2003. Frustrated by integration "donkey work," he started the Mule project to bring a modern approach, one of assembly, rather than repetitive coding, to developers worldwide. Now, with the MuleSoft team, Ross is taking these founding principles of dead-simple integration to the cloud with Mule iON, an integration platform as a service (iPaaS).